Doc: Did you grow me some fat? 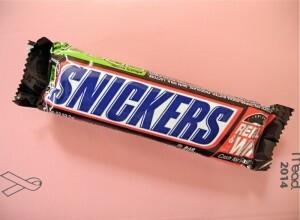 Me: (pause) Err, I ate a few Snicker’s bars. Me: Ha! I’m so out of shape (truth). Me: OK, and be nice to my biker legs. Nurse: I recognize you from before. Me: Really? Seriously, the nurse remembered me. Frequent Flyer status in day surgery pre-op! “Yes, I picked up two pounds of fat at the market on the way in!” Yup, that would have been a fine answer. Reality is, cancer and treatment is serious business. But the good news–it’s come a long way. Breast reconstruction–implants, fat grafting–no implants–we have options. Fat grafting does involve using your own body fat. I did have to wrap that thought around my head for a while. Honestly, I did not have a huge amount to offer. Maybe I poke fun at a lot of things, but above all, I respect my docs. It seems right that we are always on the “same page” about my care. It’s the way it should be. Impressive as doctors are in their chosen field, it’s about the helping patients feel good about themselves part that is so uplifting and needed. I’m very lucky everything has worked out over the years. Always counting my blessings. Per usual, I began to document the whole process once home in recovery mode. And relaxing in post-surgical attire is so much fun. Not!! I never wore a “girdle” in my life until I met my doc. That’s the truth. But that bra… a pink one with dangling rings. Ohhh. I liken the rings to life preservers. I’m pretty sure these little rings are in fact drain tube catches. Today, drain tube pouches are built into the bras. That’s very helpful for breast cancer patients. On this day I did not need them. I seemed to be a “day late” on the age of products; used safety pins for my prior post-op mastectomy needs. I have tons of safety pins from racing bikes. I put them to use pinning everything, not just race numbers! But on this day I got the pink bra. It made me smile that all the hospital staff were admiring my new pink lingerie! I had no clue — pretty out of it post-op. Pin-Up Girl, mixed media, 2003. This is a detail of one of my healing arts pieces–notice the safety pins on my johnny. I think the title was quite fitting at the time. Given my past/present status, I’ve learned to listen to my body. I’m also still serious about training and fitness. I’ve got the will power to get back some of the good form I worked hard at in the past, and I can do it again! The laughter and humor medicine worked its magic. Looking ahead to blue sky and sunshine! See you on the road. 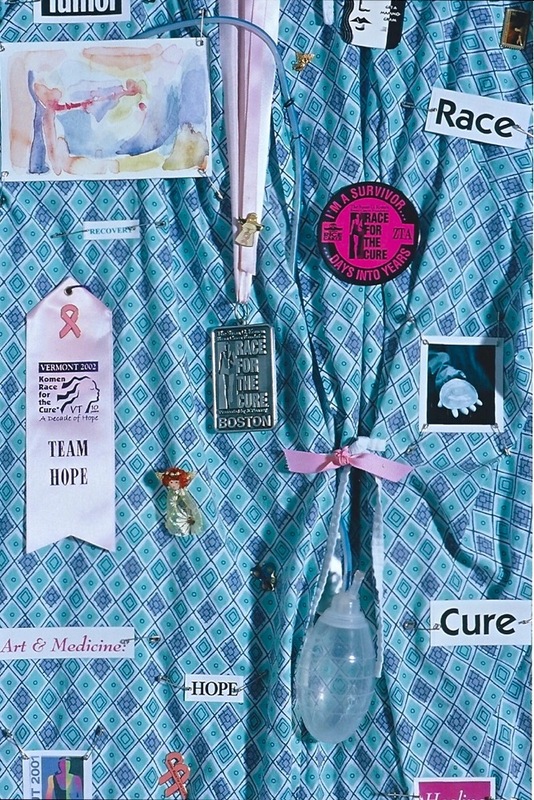 This entry was posted in Breast Cancer, Cancer, Healing Arts. Bookmark the permalink.